The number of US farm jobs certified to be filled with H-2A workers almost doubled between FY11 and FY15, from about 77,000 to 140,000. The number of employers (including coops and custom harvesters that request certification to fill jobs on multiple farms) was stable at about 7,500, suggesting that current H-2A users are requesting more workers. 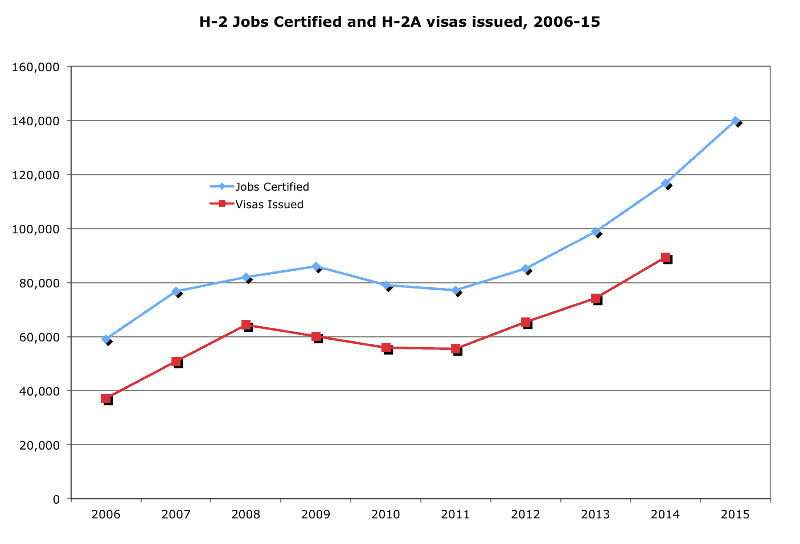 Some H-2A workers fill more than one job, so that more jobs are certified than visas are issued to H-2A workers. The ratio of H-2A visas issued to certified farm jobs has been about 1.3 in recent years, meaning that for every 130 farm jobs certified, DOS issued 100 H-2A visas. DHS admissions data are not useful because they record each entry, so that an H-2A worker living in Mexico and working in the Yuma, Arizona area creates an admission each day he enters the US.